UTA’s (4-4) 63-56 win over a good Weber State team (WSU at 3-4 playing a difficult schedule with wins over Nevada and Oral Roberts this season, losses to UTA, Illinois State, LSU, Utah State) was fun to watch, with no lead really being safe. After getting off to slow start offensively and being down 8 about 4 minutes into the game 2-10, UTA scored 13 unanswered points to take a 15-10 lead. The Mavs would take a (what seemed, anyway) comfortable 28-21 lead into halftime. UTA shot 40% FG and held WSU to 29% FG shooting in the first half. Mavs looking good at that point…outside shot not really falling (1-7 for the half) but UTA finding ways to score and, like in the Texas game, really starting to pass the ball down into the paint with success. But after a UTA layup to open the first half put the lead at 9 (30-21), WSU got hot with some good outside shooting and a couple of impressive dunks (guard Jeremy Senglin from Arlington-Bowie made three consecutive threes) and next thing you know, the Mavs are down 38-30 with about 9 minutes left. Would the Mavs be able to answer? Yes. Down 8, the Mavs would build a 9 point lead over the next seven minutes or so at 55-46 with 3:31 left and the game seemed to pretty much over at the point…until Weber State had one last impressive comeback attempt, making some layups and free throws to trim the Mav lead to 1 at 57-56 with 1:20. 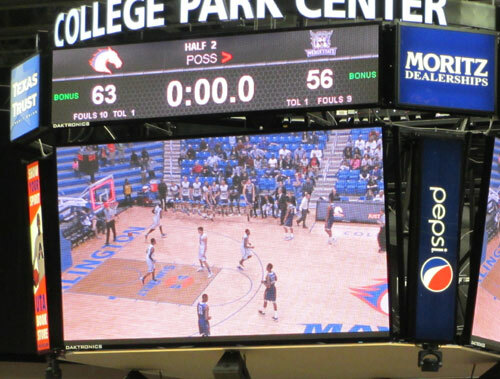 But those were the last points WSU would score as a UTA 6-0 run with a Johnny Hill layup and a free throws by Kevin Hervey and Lonnie McClanahan would end the game at 63-56. Weber State was picked to finish first in the Big Sky preseason polls, and it’s easy to see why. Guard Jeremy Senglin is a great shooter and Joel Bolomboy (6-9, 230) and Kyndahl Hill (6-7, 218) are two powerful forward/centers who can really score and rebound. Weber runs the fast break as well as any team I’ve seen in recent years, finishing with several impressive dunks. But overall, the Mavs got a nice win with a strong defensive effort. Johnny Hill had several steals and the UTA guards matched up well against WSU’s extremely quick, athletic guards most of the game. UTA had 6 steals and deflected several passes. The Mavs outrebounded WSU 39-35 (Gainey 8, Wilson 7). It was also good to see the Mavs scoring without the threes falling (only 3-15 for 20%) and having to overcome an 8 point deficit midway in the second half…this might be one of those wins that can build some momentum as we get closer to conference play. Up next: at UC-Irvine next saturday at 9 pm CST. The Anteaters are 3-3 including a win over Pacific, losses to Arizona, St. Mary’s and Fresno State. This entry was posted in College Park Center, Weber State, Win by rustyhancock. Bookmark the permalink.